As online and blended learning reshapes the landscape of teaching and learning in higher education, the need to encourage and support faculty to move from delivering passive, teacher-centered experiences to designing active, student-centered learning increases. Our new social era is rich with simple, free to low-cost emerging technologies that are increasing experimentation and discovery in the scholarship of teaching and learning. While the literature about Web 2.0 tools are impacting teaching and learning is increasing, there is a lack of knowledge about how the adoption of these technologies is impacting the support needs of higher education faculty. This knowledge is essential to develop new, sustainable faculty support solutions. Driven by my own experiences as a full-time and part-time faculty and early adopter of VoiceThread -- a Web 2.0 tool that fosters asynchronous voice, video, and text conversations around media -- I designed my dissertation research study to investigate the how the use of Web 2.0 tools is impacting the support needs of higher education faculty. I performed this action research study in collaboration with the VoiceThread organization with the purpose of improving the support needs of their higher education users. Just-in-time resources. Faculty support programs comprised of face-to-face workshops and consultations will not meet the needs of faculty. The issues underlying this finding are related to the significant changes in the demographics of faculty. Today, most classes are taught by part-time faculty and many of these individuals also have a full-time job and teach at multiple institutions. Online resources that can be accessed from anywhere at anytime from multiple devices are essential to supporting innovations in teaching and learning. Non-linear PD experiences. Faculty who adopt new technologies desire non-linear professional development experiences to support the integration of technology into their classes. Faculty noted that accessing an eBook to learn new strategies to teach with VoiceThread was "less risky" than spending the time in a workshop, as the eBook provided non-linear pathways, allowing a faculty member to engage with the topics that align best with her/his needs. Community. The adoption of emerging technologies by faculty is resulting in pockets of innovation on campus. As a result, faculty who integrate emerging technologies into their teaching feel isolated from their peers. Professional learning networks designed to connect faculty and promote sharing of practices and ideas will be key to supporting faculty. Social technologies like Twitter, Hangouts on Air, and Google+ Communities will continue to play important roles in connecting faculty innovators across campuses. Funding for accounts. The freemium model employed by most edtech companies provides faculty with a low-barrier entrance and encourages experimentation. However, as the adoption cycle for Web 2.0 tools matures, many faculty are finding themselves paying out of pocket for the premium version(s) of their tool(s) of choice. While will need to consider new funding approaches for supporting faculty within these pockets of innovation. LMS integration. Learning Management Systems (LMSs) remain the most pervasively used technology in higher education. Learning Technologies Interoperability (LTI) is an industry standard that provides a simple way for web-based technologies to integrate with major LMSs. offering streamlined teaching experiences that may eliminate the need for students to create accounts and provide the ability to grade the activity inside the LMS. Faculty see LTI integration as an opportunity to save them time and promote more adoption across campus. However, faculty have the perception that administration want to see strong adoption rates prior to considering an LMS integration. This tension is evidence that faculty use of web-based tools is reshaping the teaching and learning landscape. Faculty support must be understood as a dynamic process that needs to adapt to the changing needs of instructors. Colleges, universities, and edtech companies exist within a new edtech ecosystem. 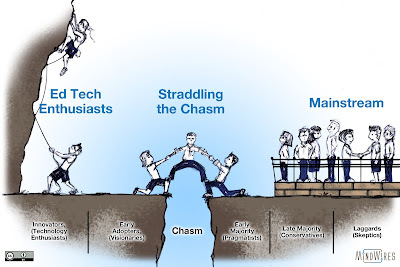 Organizations within this ecosystem have a shared interest in supporting faculty who teach with emerging technologies. In my next post, I will discuss the potential that co-created faculty support resources hold for providing continuous support for faculty, as well as empowering instructors to be leaders in teaching and learning innovations.